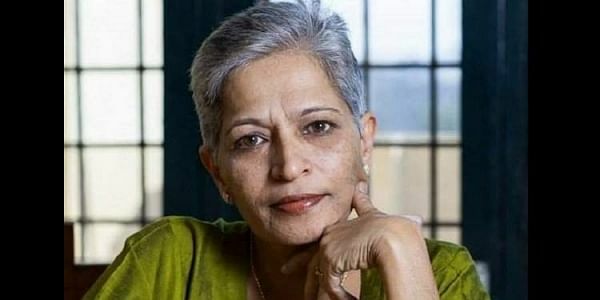 JNUSU president Kanhaiya Kumar, comic artist Sanjay Rajoura and JNU student Umar Khalid on Friday held a panel discussion on a book on murdered journalist Gauri Lankesh. New Delhi: JNUSU president Kanhaiya Kumar, comic artist Sanjay Rajoura and JNU student Umar Khalid on Friday held a panel discussion on a book on murdered journalist Gauri Lankesh. Speaking on the occassion Khalid recalled his personal association with Lankesh and said, "Her murder is no less than an act of terror," and added that it was our duty to keep working for issues for which the journalist had given her life. Kanhaiya said it was important that people united against the fascist forces in country. "They have succeed because we do not have unity. Gauri understood the importance of this unity and fought till the end for it," he said. The book, titled The Way I See It: A Gauri Lankesh Reader is edited by Chandan Gowda has a foreword by Paul Zacharia. It showcases some of the most prominent works of the slain journalist.